Homeowners are quite susceptible to experiencing some type of flooding or leakage on their property during the bomb cyclone, which is why the water damage specialists at 911 Restoration of Washington DC are here to help around the clock. We want you to know that we truly care about being there for you, so we keep our office open 24/7/365, enabling you to call us the moment this winter storm disaster strikes. 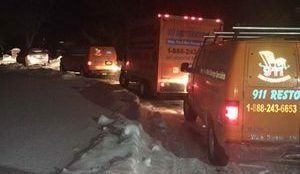 Our water removal members always act fast when the circumstances involve the high winds and heavy snowfall, so we guarantee that we will be at your home within 45 minutes of receiving your call. Call 911 Restoration of Washington DC today and we will conduct a free home inspection as soon as we arrive so we can get the process started immediately. If the freezing temperatures caused by the cold spike cause the pipes in your home to freeze, it is important to thaw them immediately before they crack. Any water inside will expand and break the pipe, leading to a burst once the water thaws and is able to flow through them again. Inspect your pipes regularly during the storm, and if you find any frozen sections immediately take measures to warm them up. One of the best ways to find a frozen pipe is to simply try to turn your water on and it trickles out. Most likely the frozen section is near an exterior wall or where the water service enters the home through the foundation. Apply heat to the frozen pipe by wrapping it in a heating pad or with towels soaked in hot water. You can also use a hair dryer or space heater on the frozen pipe. Just make sure to not use a propane heater, blow torch, charcoal stove or a blowtorch. Any open flame can be dangerous. Keep your faucets open while you are thawing out the pipe and take notice of how strong the water flow becomes as you heat the pipe. Once full water pressure is restored then you know it is properly thawed. 911 Restoration Washington DC can also assist you with any issues surrounding frozen pipes or a pipe burst, so if you need additional help do not hesitate to call our office during the storm. Our storm damage repair team knows that the cost of the repairs plays a big part in what kind of services homeowners are going to seek out. Our storm damage mitigation techs will even help you file your insurance claim, taking over the entire process if you need us to. We will do all we can to make sure you get the proper coverage. The bottom line is that whatever situation you find yourself in, you can count on us to make your home look like it was never ravaged by a bomb cyclone, and at an affordable price. So, call 911 Restoration of Washington DC today and we will make sure you are taken care of the entire time this storm is underway.